Felt or Foam: Felt 1/8" Foam 1/8"
Medical Grade Hammertoe Stick On Foot Corn Pads: Same medical quality corn pads as dispensed from Doctor's Offices. 100 bulk large corn pads per pack. 3 mm (1/8 inch) thick corn pads. Toe corn cushions are made to protect hammertoes, corns, and soft corns. Our foot pads are produced in the USA of medical grade felt or foam. Corn pads used to treat corns on feet. Hammer toe pads self-adhesive stick on foot pads. Prevent corns on feet from hammertoes. Decreases friction on the hammertoe knuckles that cause corns on feet. 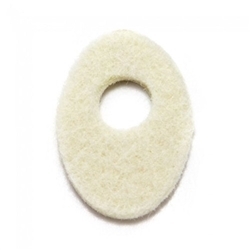 Our corn cushions foot products come in medical grade felt or foam. + do not place large corn pad on open skin. Read more about how to properly use corn pads by visiting our Learning Center! Large Corn Pads prevent hammertoe corns on feet. Toe pads are foot products made in the USA. Atlas Biomechanics' large corn pads are great for Soft Corns also. A soft corn is corn between the toes usually at the toe joint. When the foot sweats the soft corn absorbs the moisture and becomes white. If left alone, a soft corn can develop into a sore, become infected and become an ulcer. Treat your soft corns with an Atlas Biomechanics corn pad from our foot pad selection.